Perhaps best known for his sitcom personas, Tony Danza is indisputably one of America's most popular performers. Having starred on some of television's most beloved and long-running series, from "Taxi" to "Who's the Boss," Danza also has established himself as a stage and screen star, as well as a respected entertainer. And now, he's entering the world of daytime television with "The Tony Danza Show," a new talk show blending celebrity interviews, human interest stories, cooking and audience participation. The show launches in Fall 2004 in national syndication. Born and raised in Brooklyn, Danza received a wrestling scholarship to the University of Dubuque in Iowa, where he earned a Bachelor's degree in History Education. Discovered at a boxing gymnasium in New York, Danza was ultimately cast in the critically acclaimed series "Taxi," earning him a place in television history. 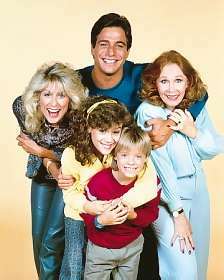 He followed with a starring role in the ABC comedy series "Who's the Boss?" which ran for eight seasons; Danza directed several episodes. His recent television experience includes a role as attorney Joe Celano on the CBS dramatic series "Family Law" opposite a stellar ensemble cast including Kathleen Quinlan, Chris McDonald and Dixie Carter. Danza received an Emmy nomination for his performance on David E. Kelley's award-winning series "The Practice." His small-screen credits include a performance opposite George C. Scott and Jack Lemmon in Showtime's remake of the film classic "12 Angry Men." Danza was seen in the Disney/ABC television movies "The Garbage Picking Field Goal Kicking Philadelphia Phenomenon" and "Noah," and starred in and executive produced the ABC comedy series "Hudson Street" and NBC's "The Tony Danza Show." He hosted the 2001 "Miss America Pageant," and the 2003 "People's Choice Awards" for national television. Via his production company, Katie Face Productions, Danza is actively involved in all forms of television, including production of the highly rated "Before They Were Stars" specials. On the big screen, Danza starred in Walt Disney's "Angels in the Outfield" with Danny Glover, "She's Out Of Control," and Frank Rainore's action-drama "A Brooklyn State of Mind" with Vincent Spano, Danny Aiello and Maria Grazia Cucinotta, among other projects. Danza wrote, directed and starred in the short film inspired by personal events entitled "Mama Mia." For his theatrical debut in "Wrong Turn at Lungfish," he earned an Outer Critic's Circle Award nomination. On stage, Danza received critical acclaim for his portrayal of Rocky the bartender in the Broadway revival of Eugene O'Neill's "The Iceman Cometh" opposite Kevin Spacey in its return to Broadway at the Brook Atkinson Theater. He made his Broadway debut in Arthur Miller's Tony Award-winning play "A View From The Bridge." Danza spent much of the last eight years touring with his live act, most recently showcasing the newest version of his song and dance show with stops in New York, Texas, Ohio, Michigan, West Virginia, Las Vegas, California and Florida among other locations. He released his debut album The House I Live In last year. It includes his well-received single of the same name, which Billboard Magazine named as the adult contemporary pick of the week. The album includes Danza's versions of many of the classics with which he grew up, including "That's All," "Pennies from Heaven," "Goodnight My Love," "I'll Be Seeing You" and a compelling version of "Little Child" (Daddy Dear), sung with his daughter Emily. For nearly a decade, multi-talented actor Jaleel White delighted audiences as America�s favorite nerd, Steve Urkel, on the hit sitcom "Family Matters." He took what was originally a one-time guest appearance on the freshman series and created such a stir that he not only became a permanent cast member, but went on to perform other unforgettable characters such as Myrtle Urkel, Steve�s southern belle cousin, and Stefan Urquelle, Steve�s suave alter-ego. White�s contribution to "Family Matters" was evident behind the scenes as well, as he wrote several episodes of the series and supplied story ideas for many others.